Electronic SA reported today that HP in a briefing to its staff said that the price of the TouchPad was now dropping permanently lower. 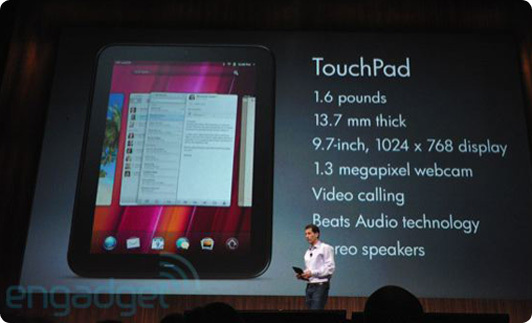 Following a weekend sale, the 16GB webOS tablet would settle at a consistent $400 price while its 32GB requivalent would cost $500. No indication was given as to whether the TouchPad 4G would drop from its anticipated $700 price. Those who bought and started using their TouchPads before the discounts would get the $50 App Catalog credit given earlier. Retailers were already showing the price cut with no mention of it being temporary, including Amazon. DiFranco explained the decision as a virtue of HP being “pleased with customer response” after the weekend discount and wanting to continue that success. While HP is known to very frequently offer temporary discounts on its PCs, sometimes just weeks after they go on sale, a permanent discount is likely a sign adoption hasn’t taken off as quickly as the company had planned. Officials haven’t given out shipment numbers and aren’t expected to until HP’s quarterly results arrive later in the month, but a $100 cut just one month after release is usually an indication customers perceive the price as too high. Previous B&N Offering $100 Discount On All Nook Models!